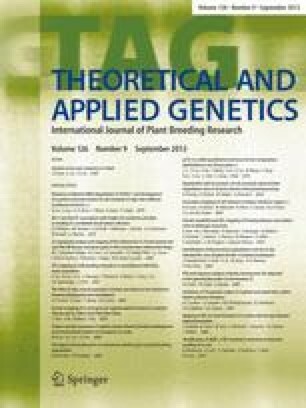 The Brazilian tropical adapted soybeans contains, in addition to superior morphological characters, genetic factors for tolerance to cultivation in acidic, mineral-stressed soils. However, the selection process for these hindrances has been empirical, and information on the genetics of mineral element uptake by the plant is necessary. The objective of this investigation was to identify the mode of inheritance for the absorption of phosphorus, potassium, calcium, magnesium, iron, aluminium, manganese, zinc and copper in a 9 × 9 diallel cross. General combining ability (GCA) was higher than specific combining ability (SCA), with the exception of copper, manganese and zinc, indicating predominantly additive effects. The ratios of GCA/SCA varied between 3.4 (calcium) and 8.5 (magnesium). The regression of covariance (Wr) on variance (Vr) showed that the additive-dominance model explained the genetic differences in this germ plasm. However, the detection of overdominance could be related to possible heterozygosity in the parental varieties for mineral absorption. Broad-sense heritability values were higher than narrow sense heritability values for aluminium, iron, potassium, calcium and magnesium, being in the range of 67.9–86.9% and 42.0–56.6%, respectively. This is an indication that soybeans can be further improved to efficient utilisation of nutrients and to tolerate toxic factors in the soil.